ESO’s HAWK-I infrared instrument on the Very Large Telescope (VLT) in Chile has been used to peer deeper into the heart of Orion Nebula than ever before. The spectacular picture reveals about ten times as many brown dwarfs and isolated planetary-mass objects than were previously known. This discovery poses challenges for the widely accepted scenario for Orion’s star formation history. 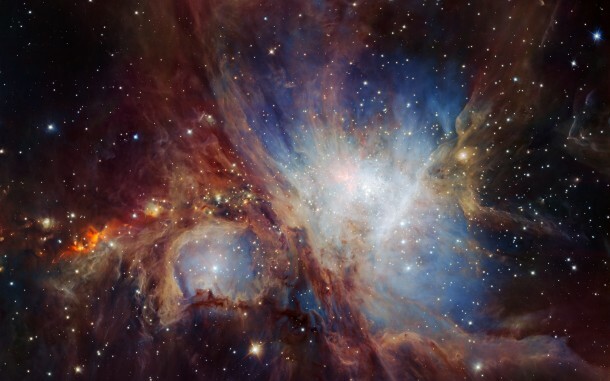 An international team has made use of the power of the HAWK-I infrared instrument on ESO’s Very Large Telescope (VLT) to produce the deepest and most comprehensive view of the Orion Nebula  to date. Not only has this led to an image of spectacular beauty, but it has revealed a great abundance of faint brown dwarfs and isolated planetary-mass objects. The very presence of these low-mass bodies provides an exciting insight into the history of star formation within the nebula itself. The relative proximity of the Orion Nebula  makes it an ideal testbed to better understand the process and history of star formation, and to determine how many stars of different masses form. 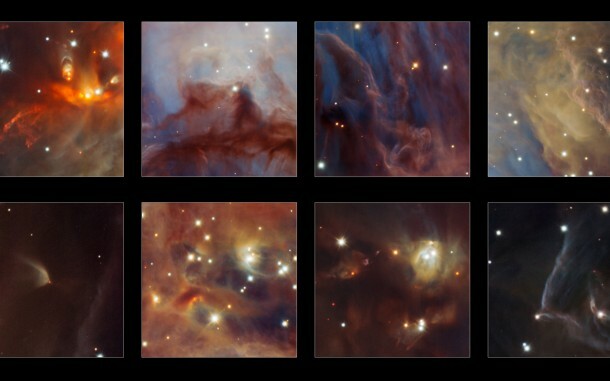 Astronomers count up how many objects of different masses form in regions like the Orion Nebula to try to understand the star-formation process . Before this research the greatest number of objects were found with masses of about one quarter that of our Sun. The discovery of a plethora of new objects with masses far lower than this in the Orion Nebula has now created a second maximum at a much lower mass in the distribution of star counts. This image shows some highlights from a spectacular new image of the Orion Nebula star-formation region obtained from multiple exposures using the HAWK-I infrared camera on ESO’s Very Large Telescope in Chile. This is the deepest view ever of this region and reveals more very faint planetary-mass objects than expected. Credit: ESO/H. Drass et al. Nebulae such as the famous one in Orion are also known as H II regions to indicate that they contain ionised hydrogen. These immense clouds of interstellar gas are sites of star formation throughout the Universe. The Orion Nebula is estimated to lie about 1350 light-years from Earth. This information is used to create something called the Initial Mass Function (IMF) — a way of describing how many stars of different masses make up a stellar population at its birth. This provides an insight into the stellar population’s origins. In other words, determining an accurate IMF, and having a solid theory to explain the origin of the IMF is of fundamental importance in the study of star formation.